Unearthed outside of the city of Sano in Tochigi-ken, this portrait photography series documents Japan as it engaged with modernization and commercial photography in the Meiji and Taishō Periods. This post marks the Tokyo opening of the Meeting Modernity Exhibition. A night of presentations, discourse, music, and booze. Come on down to the infamous Hybrid SO+BA Gallery in Kyodo (Odakyu Line) for a night of revelry with the staff of Néojaponisme. A smattering of presentations by the editors of and contributors to the site will be accompanied by Funkmaster DJ Jean Snow on the wheels of steel. Possibly the hippest cat on the block, this site is run by a group of cooler-than-thou arty types, mainly based in Tokyo. They certainly know their stuff, and hitting the site regularly enough leaves you with the satisfying feeling that you’re kinda hangin’ wid da in-crowd. Don’t get any big ideas, though. You’re still too dassai to approach them in reality. If you approach us at parties, we will inform you that dasai has one “s” and then go back to being horribly nerdy misanthropes with persecution complexes. Alas, I speak for myself. No, we kid, we kid. We always appreciate compliments and show our gratitude by being completely uncomfortable on how to react and descending into strange self-parody. Also, a personal triumph: MEKAS. — Best Poser Site. I think he means “cultural elitist” for “poser” since the best “poser” site would be a site posing to be cultural elitist, right? My idea for Best Poser Site would be a collection of photos capturing all the guys in my high school who ran out to get chain-wallets and Dinosaur Jr. T-shirts in early 1994. A special page would be dedicated to Straight Edge tattoos for guys who stopped being straight edge after about three months. We snuck into type design collective Underware’s site today. 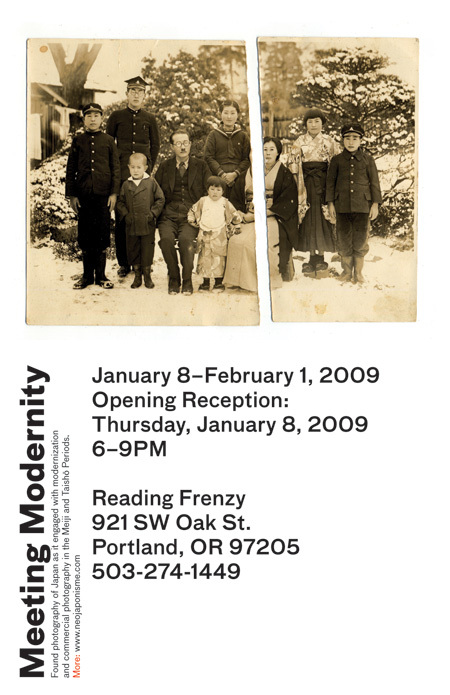 Néojaponisme’s exhibition Meeting Modernity will be in Portland from January 8 through February 1st in the new year at downtown small press emporium Reading Frenzy. The opening will be on January 8 from 6–9PM. I’ll be in attendance (as will Ma and Pa Lynam! ), so come on down. Recently discovered outside of the city of Sano in Tochigi-ken, the Meeting Modernity collection of found photos documents Japan as it engaged with modernization and commercial photography in the Meiji and Taishō Periods. The series is comprised of portrait photography in particular. For December, the final month of 2008, Néojaponisme will only be running “2008: The Year in Review” mini pieces, covering various topics from the year that is/was. Get your typing fingers ready for comment frenzy as we discuss the finer points of Japan’s economy, political system, pop culture, and technological progress! A bit preemptive, but what the hell… Néojaponisme’s exhibition Meeting Modernity will be in Portland from January 8 through February 1st in the new year. The opening will be on January 8 from 6–9PM. I’ll be in attendance (as will Ma and Pa Lynam! ), so come on down. 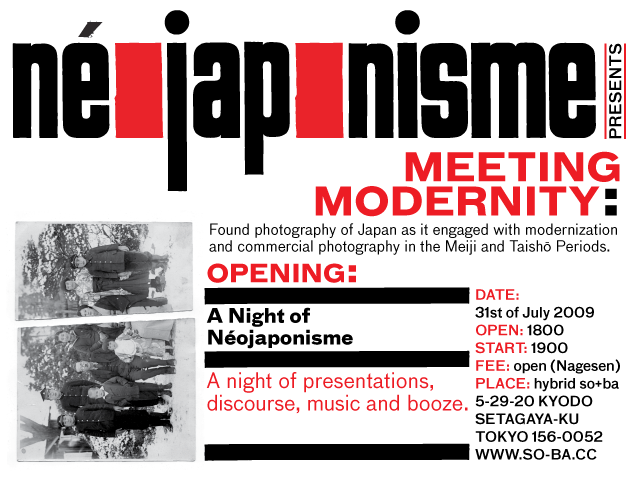 The Meeting Modernity series of found photographs is the focus of Néojaponisme’s first traveling exhibition. Recently unearthed outside of the city of Sano in Tochigi-ken, this series of pictures documents Japan as it engaged with modernization and commercial photography in the Meiji and Taishō Periods. The series is comprised of portrait photography in particular. 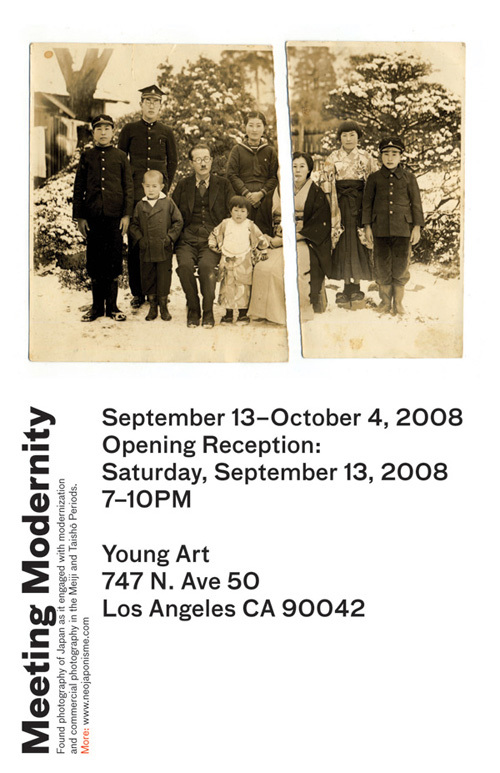 The exhibition debuts next month at Young Art, a gallery in Los Angeles’ Highland Park. Sorry for the recent slowdown in articles. Ian is in Europe, and I have been super busy with both work and non-work. I am sitting on a huge pile of articles that need to be edited, so good news is, once things calm down this weekend, we will be back in business. Néojaponisme gets a nice write-up in the new issue of Asian culture magazine Theme (Issue 14). I am quoted in this article. I know there are some old-timer, culture-lovin’ expats in Tokyo who probably differ with my appraisal that there’s something new about being young and obsessed with contemporary Japanese pop in the 21st century. But every time I go to some obscure music event in the city and see a half-dozen white kids in the front row (something that would have been absolutely shocking at a Supercar show in 1998 or Readymade Records night in 2000), I have to think that things have changed for the positive. Heartland Brewery may be the new Gas Panic, but there’s now a countervailing force in town to all that Occupation-era residue. Also, watch out Dave Spector and Pakkun! Here comes Magibon! Become a foreign Japanese-TV celebrity without leaving your own bedroom! Why has there been very little content on Néojaponisme lately? I, W. David Marx — Chief Editor, have been in Los Angeles in a jetlag-haze for the last week, and I will be in a jetlag-haze in Tokyo for the next week until I can get my schedule back in order. Team Néojaponisme have also been working on lots of big things: book releases, album releases, etc. We also have full-time jobs, although we aren’t supposed to mention that to maintain a myth of artistic dedication to our respective crafts. Can we expect this content winter to continue? Yes and no. We are currently planning out a very big step for Néojaponisme — perhaps launching it into physical space. (But not literally “outer space.”) There are essays being written and assignments being assigned. Things may be light for a bit though, so if you are thinking of bothering us with a story idea, this is an excellent time. Is there anything you can recommend while the nuclear content winter is defrosting? I did this podcast with Patrick Macias in Los Angeles. We discuss Cool Japan. Also, I will have some personal L.A. dispatches over the next week, hopefully. 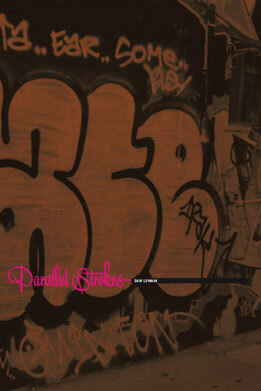 My new book, Parallel Strokes, is available now via the book website. It isn’t officially being released for a week, but I figured Néojaponisme/Meta no Tame readers should have a chance before other folks. Interviews within include conversations with pan-European type design collective Underware, Japanese type designer Akira Kobayashi, American graffiti writer and fine artist Barry McGee/Twist, German graffiti writers Daim and Seak, American lettering artist, graphic designer and design educator Ed Fella, among others. Parallel Strokes is an enquiry into the history, context, and development of lettering today, both culturally approved and illicit. The result of six years of research in the combined arts of lettering, graffiti, and typeface design, Parallel Strokes is a collection of interviews some of the best letterform creators in the world today. Chaz Bojorquez talks about the origins of barrio graffiti in Los Angeles and the evolution of the craft. Fellow Angeleno, vernacular graphic designer Ed Fella, speaks about his history in lettering and how he earned the title “The King of Zing” in Detroit design and illustration circles. Famed Japanese type designer Akira Kobayashi discusses Roman and Japanese letterforms while showcasing a lifetime of type design work. European graffiti writers Daim, Seak, and Delta share their thoughts on dimensional graffiti lettering while American graffiti writer Mike Giant talks about vernacular lettering, typeface design, and the evolution of graffiti handstyles. Parallel Strokes is richly illustrated throughout, featuring copious previously unpublished work by the interviewed artists, as well as supplementary illustrations and photographs detailing contemporary and historical trends in graffiti and type design. The first 100 orders come with a two color 17″ x 20″ Parallel Strokes poster printed using recycled paper and soy inks at Portland, Oregon’s Pinball Publishing. Parallel Strokes is 244 pages thick and available for $25 with free shipping worldwide.